These are the treats I feed the girls. Temptations, from Canada, come in a huge variety of flavors. 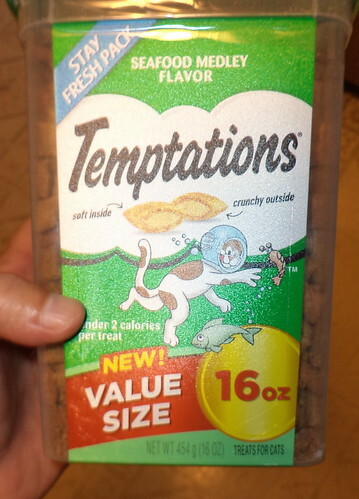 Just as I like to vary my food intake, I change up the flavor of treats they get. I buy the 3 ounce pouch which can last us for a couple months, given they don't always get treats on weekends unless I go somewhere. I was in Target last week and I always check the price on treats when I'm there. I know what they cost at the grocery so, if there was a flavor on sale, I would have purchased a couple pouches. They had this. It came in three flavors; tuna, seafood and chicken. I'm thrilled. I've purchased bigger pouches but they don't always stay shut. This container has a snap close top. That will keep the treats fresh. This is going to last us a very long time. Plus, it is a great value. I'll augment this flavor with a different flavor. I have 5 pouches; 2 unopened; on the shelf. They already know the sound a pouch of treats makes. I'm sure they will catch on, very quickly, to the sound of a container of treats. Want a Little Star Wars?